The story begins in the early 1940s when African Americans began to move into the “Jew Town” section of the Near West Side neighborhood in larger numbers. For many years this area was referred to as the “Jewish Ghetto” and was the site the famous Maxwell Street Market. When blacks arrived they were not welcomed by the Jewish community and the tensions developed quickly. The tensions were the worst at the intersection of Maxwell Street and Halsted Street and up to Roosevelt Road at the spot of the Maxwell Street market that Jews heavily regarded as their area. At some point in the early 1940s the tensions got so out of control that groups and black and white youths were fighting in the streets. This neighborhood was well known for having prominent Italian and Jewish gangs decades prior and now they were fighting with scores of black youths that were fighting for their rights to live in Jew Town. As the conflicts between Jewish and black youths escalated in Jew Town the black youths formed two street gangs to battle the Jewish gangs. Forming these clubs was the only way to size up against the tough Jewish gangs and the black youths wanted to call upon all black youths in the area to join them in the fight, this was the prophecy. The name “Imperial Chaplain” was likely chosen because a Chaplain by definition is a type of prophet that is attached to a religious group. The Imperial Chaplains would serve as the prophets to spread the word to black youths moving into Jew Town to stand up and fight for their existence. The other black gang to take form was the 14th Street Clovers that formed at 14th and Halsted just south of the Maxwell Street market. At first the two gangs could work together to fight against a common cause, however, that didn’t last long before they began fighting each other as each group wanted to stand as one against the common enemy but neither group wanted to assimilate into the other. The building of the Robert Brooks public housing projects brought many more blacks into the area and members of the Imperial Chaplains and 14th Street Clovers were the first gangs to take up residence in these buildings. Extensions were built onto the Jane Addams projects in 1943 that were built for blacks and this is when Clovers and Chaplains were moving in these buildings. In the year 1948, members of the Imperial Chaplains and 14th Street Clovers moved to the North Lawndale neighborhood as many Jewish residents moved out of the area. North Lawndale was both welcoming and spiteful of blacks moving into this neighborhood and once again friction popped off between blacks and Jews. North Lawndale was ideal for black families as their was an abundance of rental properties, because blacks were often barred from purchasing property in this community. The Chaplains made 16th and Homan down the 16th and Trumbull as their main stronghold. The rivalries between Clovers and Chaplains would now carry over onto these streets. In the year 1950, the Loomis Courts projects were constructed and Imperial Chaplains and Clovers moved into these buildings and took control. In the year 1954, James Cogwell, an Imperial Chaplain, led a group of Chaplains to break away for the possible reason that the this group had more extreme views on how to deal with the issues that they faced against racism. This new group would become the Egyptian Cobras and they formed in the same area as Chaplains and Clovers in the Jew Town area right by the Maxwell Street Market at Roosevelt and Halsted. The Chaplains were not happy about this breakaway and declared war on the Cobras but the Cobras fought viciously against Chaplains and Clovers and gained a reputation that caused their recruitment to flourish into large numbers very quickly. The Cobras also battled Italian gangs like the Taylor Street Dukes and the two gangs became bitter enemies. If any members of the Cobras could afford it they purchased black sweaters with a cobra snake emblem on it. in 1955, the Egyptian Cobras colonized the North Lawndale community in the Fillmore district at the intersection of 14th Street and Kedvale outside of William Cullen Bryant School located at 1355 South Kedvale (now closed down and removed). The Cobras also congregated at Franklin Park located down the street at 14-15th and Kolin. Right after formation news spread in every black community about the Egyptian Cobras and about their cause. The Cobras were the first gang in history geared toward creating a super gang and they began spreading in several parts of the city right after formation. The Cobras also expanded into the West Garfield Park and East Garfield Park neighborhoods in the mid-1950s.. In North Lawndale by 1955, white flight was increasing greatly because of an ongoing crime wave since 1953 that just wouldn’t stop. As white rapidly moved out of the neighborhood black families quickly replaced them. The Cobras and their rivals grew tremendously at this point in time but there was also a fracturing in the Cobras and their rivals the Imperial Chaplains. New splinter groups formed like: Dirty Sheiks, Wailing Shebas, Continental Pimps, 14th Street Clovers, Imperial Knights, Barons, Comanches, Roman Saints, Imperial Roman Cobras and the Van Dykes. Even though all these gangs were birthed out of the Chaplains and Cobras the Cobras still kept multiplying and even felt the need to distinguish between older and younger members, this is when Senior and Junior Egyptian Cobras were established. The Cobras colonized Roosevelt and Kedzie right near Douglas Park in North Lawndale. This angered the Roman Saints and bloody war would soon ensue. In the late 1950s, the wars between Cobras and their rivals worsened and became increasingly violent. The Cobras were one of the more violent street gangs in Chicago and wanted complete dominance on the streets, however, the Cobras were not a tightly organized as their new rivals the Vice Lords. The Vice Lords had the same goal as the Cobras and that was complete dominance on the streets which led to an immediately violent gang war in 1959 as Vice Lords moved in on all Cobra territories on the west side of the city. Back in 1959, the Vice Lords were just more dominating than the Cobras on the west side and Cobras began to migrate to other parts of the city during this new Vice Lord rampage. Most Cobras completely moved out of the west side and moved to the Woodlawn, Hyde Park, Fuller Park and Washington Park areas on the cities’ south side. Some Cobras even took up residence in the black belt slums at 45th and State in the Grand Boulevard neighborhood. Hyde Park Woodlawn area was led by 15 year old Henry “Johnny Ringo” Ponder. Fuller Park and Grand Boulevard and perhaps Washington Park was led by “Joe Bob.” The Cogwells continued to run the west side for now. The newly arrived Cobras found a vicious rivalry with the Devil’s Disciples that were also from Hyde Park, this started a long standing rivalry. Cobras also made their way into the Cabrini Green public housing projects on the cities’ north side as they began battling with several smaller gangs including some pockets of Imperial Chaplains and what was left of the Clovers. This is the story of how Mickey Cobras became rooted in Cabrini Green. In 1960, Henry “Johnny Ringo” Ponder was only 16 years old but already proving to be a dangerous leader as he led groups of Cobras on a murderous crime spree in the Hyde Park area between 1960 and 1962. 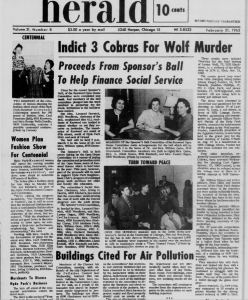 The spree started on November 23, 1960 when Ponder, James Braden and Johnathan Phillips robbed a tailor shop at 53rd and Woodlawn beating the 72 year old shop owner Lester Wolf to death. In March of 1961 the three were said to have robbed and killed a cab driver at 51st and Cottage Grove. When Ponder was arrested in February of 1962 he was already on trial for the murder of Lucious O’Neil, a security guard at a laundromat at 51st and Cottage Grove on August 19, 1961. Four other members of the Cobras were also apprehended for shooting a man at 54th and University that refused to give up his money when he was robbed (Hyde Park Harold, February 21, 1962). After Ponder was convicted of his crimes in 1962, 17 year old Henry “Mickey” Cogwell stepped up to lead the south side Cobras. Mickey was a fast-talking hustler overflowing with charisma and was heavily involved in the Policy racket that was controlled by the Italian mafia. This early relation tapped the Cobras in with organized crime. Mickey was related to founder James Cogwell but Mickey was not the founder. The Cogwell family moved to the south side in the year 1961, thus, clearing out all the old leadership from the west side, but the west side remained populated with Egyptian Cobras even after Mickey’s departure but they would operate differently. After the Egyptian Cobras settled into Robert Taylor in 1962 they came across another gang that was very similar to them called the “King Cobras.” The King Cobras were led by Theotis “Emperor Thee” Clark. Both gangs decided on a merger in 1962 that would combine their concepts. In May of 1966, Mickey was approached by Eugene “King Bull” Hairston and his Black Stone Rangers to meet at a picnic with over 20 other gang leaders on the south side. This picnic was a proposed merger for all the gangs to come together under one alliance known as the “Black P Stone Nation.” Mickey accepted just like all the other gangs at that picnic because they all had a common enemy, the Black Disciples. Theotis Clark did not agree with joining the BPSN and opposed it but he had to go along with it. The long standing war of Woodlawn between Cobras and Rangers would at last end and this would begin a more organized era for the Egyptian Cobras. The Egyptian Cobras were then known as “Cobra Stones” although this name was not heavily thrown around by members or even identified much by the press or law enforcement at first. Not only this, on the west side the Cobras were still going at it hard with the Vice Lords, and Vice Lords and Stones were somewhat allied due to deep family ties of the leaders of both organizations. The West Side Cobras still went by the name of Egyptian Cobra as did the Cobras in Cabrini Green. In Cabrini Green the Cobras there were part of the King Cobras. You see, even though Theotis Clark had to go along with technically being part of the BPSN he refused to become of Cobra Stone like Mickey did, so any Cobras that were under Clark, including Cabrini Green, where King Cobras or could be known as Egyptian Cobras. The late 1960s, gave more rise to the Egyptian Cobras than ever and not as Egyptian Cobras but more as Cobra stones. The BPSN became very active in politics, community outreach and the obtaining of thousands of dollars in government funding. This even lead to Henry Cogwell making an appearance in the white house to speak for Jeff Fort that turned down the invitation. Mickey Cogwell was now the official spokesman for the BPSN. Cogwell had more of a seat ever since his younger brother Jerome “Pony Soldier” Cogwell was killed on September 7th or 8th 1968 at 5244 State street right outside the entrance of the Robert Taylor homes, he was killed the same weekend as Jeff Fort’s younger brother Leroy Hairston. The murders were done by the Devil’s Disciples which was the main gang allied with the Black Disciples alliance. In December of 1968 Jeff Fort led a massive march down State Street demanding that the city rename State Street after Jerome Cogwell. The Stones proceeded to smash windows, cars and rioting all up and down as they marched causing destruction. This march was meant to protest the disorderly conduct charge that police were using to harass residents. Beginning in the year 1970, The Cobras in Cabrini Green began to take their war with the Black Deuces and Black Gangster Disciples to another level as the guns were blazing in these projects for the next two years causing many deaths including two Chicago police officers that were picked off by sniper fire in 1970. All the smaller gangs in the projects were caught in the crossfire and by 1972 they all either flipped to Disciples or Cobras, some became Vice Lords. In 1972, Jeff Fort was brought up on several charges for mismanaging government funding and he was sentenced to 4 years in prison. Before he left he appointed Mickey Cogwell to be the interim leader and to keep Eugene Hairston out of power if he got paroled. Cogwell at that point was running the entire BPSN on the streets and became well known along with the Cobra Stone name. By the early 1970s the Egyptian Cobras left North Lawndale and were strictly concentrated on the south side. The Egyptian Cobra name disappeared and the Cobra Stone name was all the way used. This was the new identity especially since the west side chapter was closed and Cogwell was running the whole BPSN and also he was the last boss of the numbers racket. In March of 1976, Jeff Fort was released from Leavenworth federal prison. He made a big announcement that he had converted to the nation of Islam while he was in Leavenworth, now he expected his entire BPSN to convert to the nation of Islam and become the “EL Rukns.” There was no ifs’ ands or buts about it. Members were not allowed to retain any Christian, Catholic or Baptist beliefs. This also meant no eating pork, swearing or consuming alcohol. Many Stones were not happy with this at all and wanted to object but they had to hold their tongues because Jeff Fort said if there were any objections it meant death especially for his council. Mickey was the only one to speak up about it because he felt he was close enough to Jeff Fort to say something. Jeff Fort did not become enraged so everyone thought it was all good until February 25, 1977. On this day Mickey was walking home at 3:45 in the morning to his home after he had been dropped off. An assassin came up behind him and Mickey started to run, the assassin fired his 9MM pistol into the back of Cogwell, after Cogwell collapsed the gunman shot him two more times in the back then fled. No one was prosecuted or identified as the killer but the Cobras accused Jeff Fort for ordering the hit. It was said Mickey was killed because he spoke out about the new Islamic doctrines but that was never verified. The Cobras then changed the organization’s name to the “Mickey Cobras” and declared a full scale war on the EL Rukns. The war did not die down until April, 1978 when the Mickey Cobras joined the People Nation alliance with enemies EL Rukns and Vice Lords. In the late 1970s after Mickey Cogwell’s death, the Mickey Cobras lost most of their Robert Taylor project territory to the Black Disciples with the exception of The Hole. Henry “Mickey” Cogwell was greatly missed by the Cobra Nation as he was a clever hustler and big time numbers racket Chief. For the first time since Teddy Roe, a black man was back in charge of the numbers racket since the Outfit took it over after Roe’s death in 1952. Mickey ran the racket like a mob boss and ran all Cobra Stone operations like a mob boss. It was Mickey that repaired this damaged organization that originally taught the black man to stand up to white gangs in the late 1940s and 1950s, but the organization missed the mark on how to truly create a mob-like empire that the Vice Lords had figured out and that is why the Vice Lords crushed the Cobras in North Lawndale, but Mickey rebuilt the nation when he took over sometime in the 1960s and perhaps if he lived longer the Cobras could have grown much larger and become even more complex of a mob; however, Mickey’s legacy still remained with the Cobras’ leadership that continued to operate in an organized crime fashion. After the killing of Henry Cogwell relations between Cobras and El Rukns were not good even after being bound by the People alliance. Cobras still used the name “King Cobras” to distinguish the part of the organization led by Theotis Clark and Herman “Moose” Jackson. In 1985, Jeff Fort ordered the murders of several King Cobras in April of 1985. According to court documents in the case of United States vs. Andrews, Jeff Fort wanted complete control of the heroin trade at 54th and Bishop in the Back of the Yard neighborhoods and 67th and Stoney Island in the Woodlawn neighborhood. The King Cobras stood in the way of Jeff Fort’s progress, and the indictment stated that Fort summoned the “Guerilla Family” hit squad of the El Rukns to kill off the leadership of the King Cobras. This resulted in the death of Herman “Moose” Jackson and the attempted assassination of Theotis Clark, Andre Chalmers and Tredis Murray. Rico Chalmers, Glendon McKinley, and Vicki Noldenand were all killed by the El Rukns in this conspiracy. Tredis Murray was in charge of the Cobras at this point in time. As the 1980s progressed, the Mickey Cobras grew in numbers spreading in many more areas on the south side and into some suburbs by the 1990s and 2000s. What happened to Joe Bob? What exact year did south side Cobras begin? 1954? What exact year did Cobras leave North Lawndale? What year and why did Cobras leave Henry Horner Homes? What was the time line of leaders to the year 2000?